Experts in emerging markets corporate funding gathered at Global Finance’s offices to discuss the state of the markets. GLOBAL FINANCE: What are the latest issuance trends for emerging market companies and how do you expect these to develop? JORGE CANTONNET, senior managing director, Bear Stearns: Asia has become an increasingly important component of issuance in the international capital markets. Last year, for the first time, Asia surpassed Latin America. As of the first half of 2004 about $26 billion was issued out of Asia—33% of the total issuance.That of Latin America was close to $14 billion, only 18%. ANDREW ZELTER, managing director, Bank of New York: Over the last four years the volume related to Asia has been quite dominant as it relates to the ADR market. It represents almost 75% of the number of transactions from emerging markets, including Latin America and EEMEA. JOYCE CHANG, managing director, global head of FX emerging markets and commodities research, JPMorgan: In the debt market, Russian corporate bond issuances— a trend that began last year— remains one that will be firm in 2005. We’ve seen about $9 billion in Russian corporate issuance, primarily in higher quality telcos and other industrial issuers and private sector banks. In the emerging markets debt markets all the sovereign spreads have compressed. Investors look increasingly for opportunities in corporate debt. In all regions that has outperformed the sovereign issuers this year. CHRISTOPHER WOOD, principal, debt capital markets, Banc of America Securities:We continue to see the story of the haves and have-nots.With the haves—countries such as Mexico— we’ve seen a big trend this year towards diversifying their investor base and, both the sovereign and the blue chip corporate wanting to do more in the local capital markets and less in the global debt capital markets.We have not seen investors concerned about the Middle East yet, but it could become a growing problem and it would seem to be practical to invest more resources into our Latin American partners to hedge that risk. SEBASTIAN CHATEL, executive director, equity capital markets, UBS: For the past 18 months there has been a lot of appetite for emerging market equities. We had very good performance for Latin America equities in the secondary market last year and as a result of that this year you’ve seen for the first time since ’97 the reemergence of Latin American IPOs.That market will be propelled one, by past performance, and two, the fact that a lot of money is going into emerging market equity funds.You’re seeing a lot more interest domestically as well. GF: Emerging market companies are often at a competitive disadvantage because they have higher cost of capital.What can these companies do about this? CANTONNET: One solution is to acquire assets outside of the emerging market. As the company begins to be seen as a credit risk that was diversified globally, their capital structure begins to shift and their capital costs become lower. Crossborder acquisitions or mergers are lowering the cost of capital and making corporates more competitive in the global marketplace. SUSAN KAUFMAN PURCELL, vice president, Council of the Americas: Some companies are in a very bad neighborhood, for example a country where there is a negative attitude toward capitalism. Those companies have to try and impress upon their governments that certain kinds of behavior prevent the whole country being attractive to foreign capital. CHATEL: Part of the reason for higher cost of equity and lower equity valuations was poor or less good corporate governance. In Brazil they’re trying to tackle this and the result is that companies are coming to market at valuations that are a lot closer to developed market valuations. ZELTER: Getting stronger name recognition and better familiarity with their story helps issuers tap the markets more effectively and at a lower cost of capital. 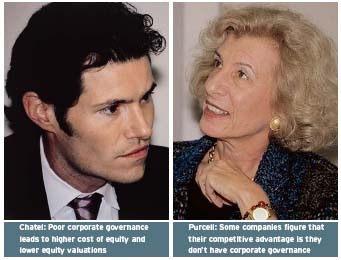 PURCELL:There are some companies that figure that their competitive advantage is they don’t have corporate governance. CANTONNET: We’re having discussions with clients that are interested in de-listing from the New York Stock Exchange, for example, and listing in the local markets because of the additional costs and restrictions from conforming to US standards. WOOD: I don’t think companies would de-list because of a lack of desire for better corporate governance, but because of the cost that Sarbanes-Oxley has imposed on those companies. CHANG: Given the strength of emerging markets this year and the improving sentiment, it’s actually been much cheaper for many corporates in the debt markets to come to market in the local markets or in syndicated loans rather than in the traditional bond markets.The combination of the increased costs for corporate governance and the fact that it’s actually not saving them very much meant many corporates chose the local markets instead of international markets to issue. CANTONNET: Local issuance will continue to be a trend and will lead to a lower cost of capital because you’re eliminating a lot of the currency risk. GF: The development of local capital markets has long been a goal for many emerging markets.What signs of progress are there on this front? CANTONNET: There is apparently $500 billion held in each of Latin America and Asia among pension funds, insurers, and banks that is available for issuance in local currency.This could be tapped by corporates but they are not fully taking advantage of this. CHATEL: Chile has a well developed local pension fund system and there’s huge amounts of ability to soak up new issuance so Chilean companies don’t need to go to the international market. More recently in Mexico there has been hardly any corporate US dollar issuance because there is a good local alternative in local pesos so you don’t have the currency mismatch. Brazil could be a success story, too, but local rates are so high still that it’s very difficult to find attractive local debt financing. CHANG: In Asia we’re seeing a broadening of the investor base to include insurance companies, pension funds and fund managers. Regulations have been passed in favor of domestic investors’ involvement in the markets. In 2003 regulators in Korea and Taiwan relaxed some of the investment restrictions. Malaysia relaxed the reserve requirements for domestic banks for certain types of debt, and in China there is some relaxation as well. GF: Does a robust local capital market affect the roles of international banks? CANTONNET: Our fees are coming down and the competition’s getting tougher in cross-border deals, partly because the local component of financing is becoming very important. International banks with a local presence can fulfill local and international financing needs, though, which will drive global banks to provide local service. WOOD: The development of local markets and the growth of global banks is not good for some of our businesses but it is making capital available to companies that perhaps wouldn’t have had that access before. PURCELL : I’ve heard many complaints, particularly in Argentina, that the global banks that have a local presence are still acting more global than national. WOOD: Credit standards are still credit standards—just because it’s based locally doesn’t mean it will act differently than it does anywhere else in the world. CHATEL: Argentina’s a very special case. In other countries, local banks that are now foreign-owned have not significantly changed their policies toward their local clients as a result of the change of ownership. ZELTER: In many cases the local bank’s product offering increases when it is taken over by a global bank. 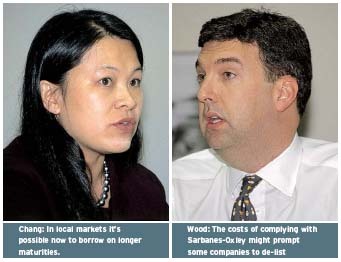 CHANG: One trend in local markets is that it’s possible now to borrow on longer maturities.That really has changed the options that local companies have to finance themselves. WOOD: In Mexico, there’s been fiscal reform and an economic team that is committed to maintaining budget discipline and paying down debt. That’s driving down rates. GF: What’s the outlook for ADR capital raising, particularly for Asian companies? ZELTER: We’re definitely optimistic about the opportunities for ADR capital raising. Asia is the principle driver of ADR capital raisings in the emerging market category—over the past four or five years it’s represented upwards of 70% of the transaction volume. CHATEL: As equity markets globally have done better that’s helpful to emerging market equities. Right now if you’re going to raise a significant amount of equity capital, frankly you can’t do it locally and most investors still prefer owning ADRs than owning local shares. But as the local markets develop, companies might not feel the need to do ADRs because they have sufficient demand locally. Specialist international investors who want to invest can just buy in the local market. GF: How will rising US interest rates affect emerging market economies and bond markets. CANTONNET: As US interest rates rise, the relative yield advantage that emerging markets companies might have will be eroded. Investors will question the need to invest outside of their known market. CHANG: The strength of emerging markets growth has been a far bigger driver than even rising rates or higher oil prices. So the question is broader: what does the US recovery look like next year? Will global growth be down? If it is, emerging markets won’t do as well, even though the Fed isn’t moving aggressively. WOOD: Typically there’s a flight to quality when rates go up, but rates have been so low that we see a number of investors in many asset classes looking for yield. And Latin America, Asia, and EMEA offer that yield.We view that the near-term outlook as being quite favorable for emerging markets. PURCELL: A lot has to do with the price of energy. CHANG: The question is whether China can engineer a soft landing. And is Chinese demand for oil going to be as strong as what we’ve seen in this past year? PURCELL: China has become an extremely important market for Latin American commodity exports. Countries in the region will have a very different response depending on what happens to China and other large consumers of commodities. GF: How do executives at emerging markets companies view Sarbanes-Oxley and how will this influence their financing decisions and options? ZELTER: Compared with developed markets, Sarbanes-Oxley is less of an issue— or a reason to stay out of the US capital markets—within the emerging market category. CHATEL: Most companies that have ADRs already were putting up with the cost and time and effort of being a US registered company.The additional impact of Sarbanes-Oxley is marginal. For a new company that’s thinking about an IPO it might have an impact—but not huge. ZELTER: Even before Sarbanes-Oxley the act of listing in the US was an ex- pensive, time consuming process. WOOD: For big companies the additional costs are marginal. For smaller companies the cost is enormous. But perhaps they weren’t ideally suited to listing in the US anyway. 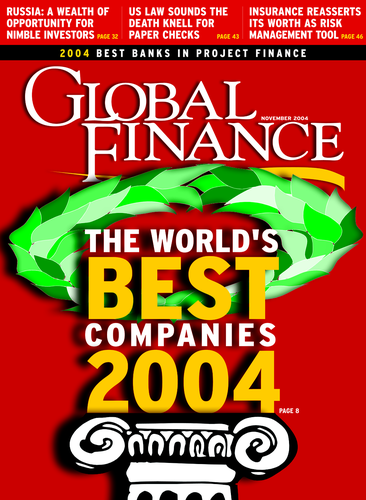 GF: What progress are emerging market companies making with corporate governance? ZELTER: They are making great progress. It’s a major theme of how they present themselves to an investment community.The local markets themselves are also making effort to elevate corporate governance standards. PURCELL:They’re making progress on transparency issues and the issue of independent directors and independent chairmen. CHATEL: It’s a mixed bag, but you are seeing much more awareness—and pressure from institutional investors on companies. If a company wants to raise equity they have to meet certain standards. The fact is it’s gradually happening and over time I think it’s inevitable that corporate governance will get better. CHANG: Companies focus first on things like the cost efficiency, reinvesting in businesses and acquisitions—the corporate governance evolves alongside that. There have been improvements but often they are a result of, for example, an acquisition where they’ve had to necessarily improve corporate governance. 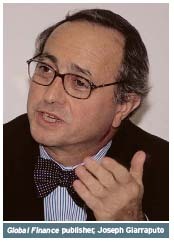 WOOD: A lot of companies in Latin America are still family-owned and their board members tend to be friends and family. Going forward as the boards become more independent we will see higher standards of corporate governance. GF: What’s the outlook for cross-border M&A; in emerging markets? WOOD: Globally, the fear that existed for the last couple years appears to be diminishing. We’ve got new players coming into the scene.You’re beginning to see companies from emerging markets buying a company in developed market. CHATEL: After all that happened in Asia and then in Argentina and Brazil it became very difficult for a US or European company to justify acquisitions in emerging markets. In the past year that’s changed. It’s inevitable that we’ll see more and more activity. ZELTER: Will it be more corporate-tocorporate or will we see private equity funds investing? CHATEL: A lot of the private equity funds in Latin America had a pretty dismal experience and have been unwound. There have been very few success stories. But if equity IPO proves a viable option again as an asset, then I’m sure you’ll see interest again. GF: How does China impact the financing of corporates in other emerging markets? CANTONNET: I believe that China will provide the hard currency flows that its corporates need to service the foreign currency banks. And that should continue to improve the credit risk for the corporates that need to govern their country’s credit risk. ZELTER Particularly in markets like Brazil and others that are strongly based on commodities, companies have aggressive China strategies.They call for expansion and expansion requires financing. That is motivating these companies to look at the capital markets fund their China strategy. WOOD: In the current environment there’s ample liquidity so I don’t think China will affect companies’ abilities to finance themselves in the international capital markets. China’s effect will be the same as it’s having on most industries. They can produce at such low prices that they put a lot of pressure on companies. That will force a lot of manufactures to find cheaper sources of capital. GF: What if China doesn’t have a soft landing? WOOD: That definitely would have severe negative repercussions, but there’s been such pressure on commodities that there may be other parts of the world that see that as an opportunity. CHANG: We have looked at the potential impact and even under our hard landing scenario the impact was really pretty minimal. China has been a positive force within Asia, with both Chinese investments among other Asian countries and the demand from China. The manufacturing companies in Latin America are more at risk as far as how they compete with China. But the effect of a hard landing would probably be more psychological than real. CANTONNET: We need to think of China not as a country that only receives foreign investment because it’s increasingly becoming a provider. It’s also been very intelligent with its investments. They have access to places such as Angola and Nigeria, countries where the US quite frankly cannot do business. Those investments will help them to grow. CHANG: One of the fears over China is that there is over-investment in certain regions. It’s difficult to monitor what is going on in the different regions at the federal level.There have been a lot of success stories in China but it is actually quite hard to gauge the transparency of the numbers.